Every neighborhood needs a local sushi joint, and for East Villagers, it’s been Takahachi for a while now. Cheap enough to be in regular rotation, good enough to warrant happy returns, and always crowded, probably because they don't deliver. There is a permanent "15 minute" wait, even at 11pm. Takahachi is everything you want out of your local Japanese home away from home. There are no frills, no omakase, and there aren’t even Japanese people cutting up your sushi - last time I went, we had a guy from Ecuador. What there is, however, is a large menu of reasonably priced cooked and raw things that will certainly leave you satisfied. This is not mind blowing food, this is "it's Tuesday, and I'm hungry food." On any given night, it’s safe to assume 75% of the restaurant are regulars. It's that kind of spot. Everyone seems to know one another, and everyone definitely knows Mr. Takahachi himself, who works the room, shakes hands, and kisses all the babies. Good food and a personal connection, no wonder people keep coming back. 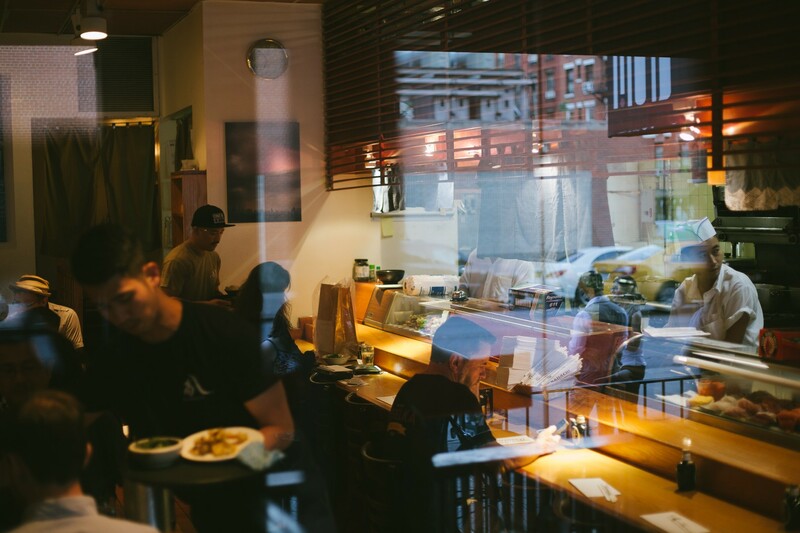 Next time you need sushi in the East Village, Takahachi is the move. There's something addictively awesome about Takahachi's Edamame. It needs to be on the table. You can eat like a king here and not completely break the bank. Stick with the basics, they do them well. Sushi, sushi rolls and sashimi. Salmon, Tuna, Yellowtail, Mackerel...you know the drill. Here you get 8 pieces and a roll. Stay away from the special rolls section of the specials menu. That's not where you want to be. Keep it simple. A nice-sized helping of blackened seared tuna served with black pepper and mustard sauce. This isn't exactly Nobu-style Toro, but it gets the job done. A favorite off the sushi bar menu. Three different kinds of sushi, all with a different spicy sauce on top. Tuna with coriander sauce, yellowtail belly with jalapeno sauce, and king salmon and avocado with spicy mayo. If you like spicy, you need to get this. Skewers are part of the program at Takahachi and need to be on the table. You can't really go wrong, but our three favorites: karubi beef, tsukune chicken ball with onion, the yakitori chicken with scallion. These are damn good. And pretty damn cheap, too. Bargain hunting? Get the sea bass. The miso glaze is on point, and the fish is cooked well and always has lots of moisture. We order this every time. Jewel Bako serves omakase and some less expensive sushi sets in the East Village.